Classic literature faces an unfair bias in today’s world. Many people relegate great books to the shelves of high school classrooms, where they once read tattered paperbacks, listened to lectures, and wrote lengthy essays. They see mastery of the classics as a necessary gateway to education, a chore to be completed rather than an experience to be enjoyed. Superfluous to contemporary life, an artifact of a bygone era. What if readers could experience these titles in a fresh, engaging, and meaningful format? The Folio Society offers such an alternative. Founded in London, England in 1947, the publisher presents the world’s great literature in an elegant form, selling premium books directly to its members and general consumers. To enhance the reading experience, they construct books using high-quality paper, slipcases, bindings, and typography. They publish a range of titles in a variety of genres, including poetry, history, religion, science, travel, and food. Examples include An Expression of the American Mind by Thomas Jefferson, The Analects by Confucius, City of God by Saint Augustine, and On the Origin of Species by Charles Darwin. In spring 2014, the society will release several new texts, including Charlotte Bronte’s classic novel, Jane Eyre; Douglas Adams’ science fiction title, Life, the Universe, and Everything, which is the third part of The Hitchhiker’s Guide to the Galaxy series; and Frederick Forsyth’s thriller, The Day of the Jackal. These three worksa literary classic, a work of science fiction, and a popular 20th Century spy noveltypify the variety of offerings. In addition to their regular staple of books, the company prints hand-numbered special limited edition titles. These pressings include literary masterpieces and facsimiles of the finest books ever published, using premium materials and techniques such as goatskin leather and gilding to set them apart from other works. Releases often include fine art sketches, etchings, medieval manuscripts, Victorian plate books, private press classics, and poetry printed using letterpress. The range of titles published each year varies as the company decides which will receive this unique presentation based entirely on the merits of the book itself. This year, they will release the first ever edition of Victor Hugo’s Toilers of the Sea, which includes his own illustrations; a facsimile of the album The Disasters of War, originally printed by Francisco Goya himself; the manuscript of Horace’s Odes, written and illuminated by William Morris; and the final six volumes of Folio’s Letterpress Shakespeare series. Because it creates a luxury item, the society differentiates itself from publishers like Penguin Classics and Everyman’s Library, which produce inexpensive, easily accessible copies of the classics with little else to entice readers. Their style resembles The Golden Cockerel Press, a defunct English premium-quality bookmaker, and Easton Press, a current competitor located in Norwalk, Connecticut. The similarities between Folio and Easton are numerous. Both use high-quality materials, space artwork throughout the text, and sell directly to either consumers or members. Indeed, both presses release some of the same titles, such as J.R.R. Tolkien’s The Lord of the Rings series and Jane Austen’s Pride and Prejudice. Attention to artistic detail is one of Folio’s hallmarks, and it sets them apart from most publishers. For each title, the company commissions accomplished artists who interpret the text and intersperse visuals throughout the book. 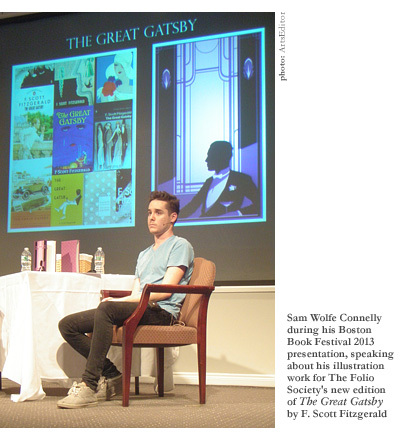 Sam Wolfe Connelly, the artist who illustrated the 2013 edition of The Great Gatsby, describes his job as being to “Transition whatever was going on in the plot into a kind of visual language,” and in the process, meld written and visual art. The company prizes the visual component of their publications and sees it as an integral part of the reading experience. Connelly describes working with the editorial staff: “I would do a piece and I would think it would be a success, but then you approach the editors who spend all their time making sure the details are accurate.” Producing the art becomes a lengthy process that involves constant revision from artists and oversight from editors to ensure the art adheres closely to the source text. In this way, the visual presentation becomes a vital extension of the book. The society’s attention to artistic detail becomes challenging with published works such as The Great Gatsby, which remain popular for a wide audience. F. Scott Fitzgerald’s seminal work has become part of the American literary lexicon. Many people intimately know the novel. Its characters, themes, plot events, and symbols pervade society. And many readers have a preconceived notion of how the characters look, act, and behave. Connelly says, “Most people know what the story’s about. You’re not necessarily giving too much away, but you still have to treat it with enough grace that you can’t be so blatant with everything.” Artists and editors faced the challenge of doing justice to the public’s ideas about the novel while expanding how they experience the narrative. Connelly acutely understood these conflicts. To reconcile them, he says, “I tried to find the most mysterious parts of the book and drag them into my illustration, making sure that I paid attention to the visual details, a lot of the color, and a lot of the scenery, the outfits” to create a new reading experience. Rather than competing with earlier presentations of the work, he chose to dramatize less popular scenes. This approach allows readers to maintain their ideas about the work while exploring often overlooked sections of the story. The constant uncertainty surrounding Jay Gatsby is integral to the novel’s appeal, and it became one of Connelly’s major challenges. At the 2013 Boston Book Festival, he gave a thoughtful presentation about the artistic and practical considerations involved in creating his illustrations, and described the editorial process in an honest, illuminating way. Even though his job was to make the action on the pages visible to readers, he freely admits, “I cannot take the mystery away from the reader.” To achieve this, he drew Gatsby without a face throughout the book. For one party scene, he set the mood by covering a surface with charcoal, then gradually scraping sections of it away. Separately, he illustrated a central white figure to represent Jay Gatsby, surrounded with darkened featureless outlines that represent the partygoers. He then digitally imposed those figures on the background to create the finished piece. The effect is haunting, and it effectively displays Gatsby’s opulence juxtaposed against the emptiness he feels. 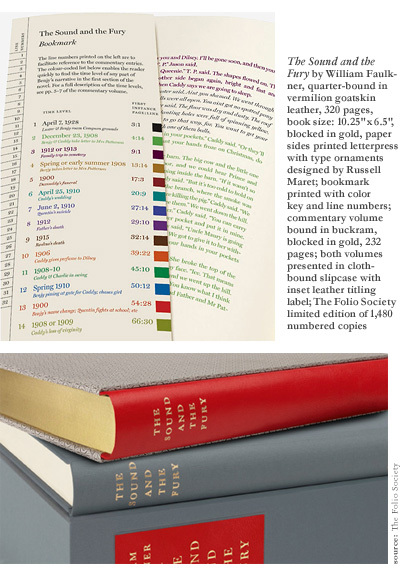 The Folio Society’s editors take great care to present each book in the catalogue consistent with its literary style and time period. Their faithful reproduction of Geoffrey Chaucer’s The Canterbury Tales is imposing. The leather-bound volume measures over a foot in length and weighs nearly ten pounds. 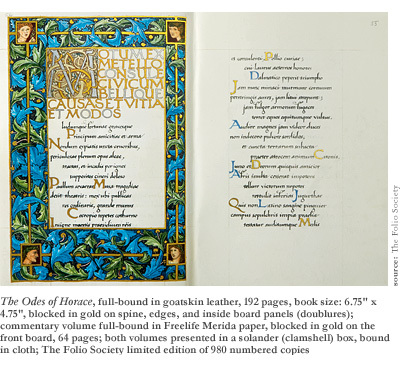 The cover greets the reader with 24-karat gold blocking and accents running down the margins, so that it resembles an authentic medieval text. When reading the Middle English, the reader gets the feeling of engaging with an object of great importance, an artifact of the past brought into the present. Compared to The Great Gatsby, the visual art is understated, but with additional gravity. 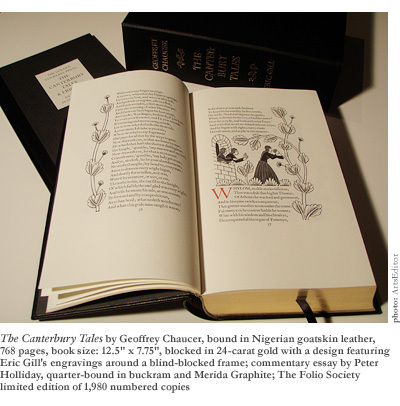 Eric Gill’s historical engravings, combined with the book’s construction and Chaucer’s language, feel like the perfect presentation for these classic tales. While Folio emphasizes visual art, they never let it overpower the effectiveness of the source text. Their limited edition of William Faulkner’s The Sound and the Fury is a text that resists heavy visual representation. Unlike other works, there are no illustrations or engravings. When Faulkner originally wrote the book, he wished for the complex stream-of-consciousness narrative to be color-coded to signal the frequent, abrupt shifts in time and narrative voice. Folio’s printing of the novel follows the original color-coding, making it reflect the author’s unrealized wishes. They also published a literary companion to the novel, which allows readers to better understand and experience this supremely complex work. So how does The Folio Society fit into the contemporary publishing landscape? Sam Wolfe Connelly provides an answer to this question: “It’s not every day that you come around to a publisher who celebrates art at the same level as they do the actual literature.” This is the power Folio brings to their workdedication to providing readers with a fully realized artistic vision. Instead of flimsy paperback pressings or ephemeral electronic versions of the world’s great texts, they make impressive books that emanate their cultural importance. It is at once luxurious and necessary.